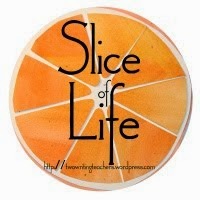 I'm slicing with the Two Writing Teachers community for Day Twenty-Nine of Thirty-One of the Slice of Life Challenge in March. Thank you Stacey, Tara, Anna, Betsy, Dana, Kathleen, Beth, and Deb. Wow-two days to go! Congratulations to all who've sliced twenty-nine days! 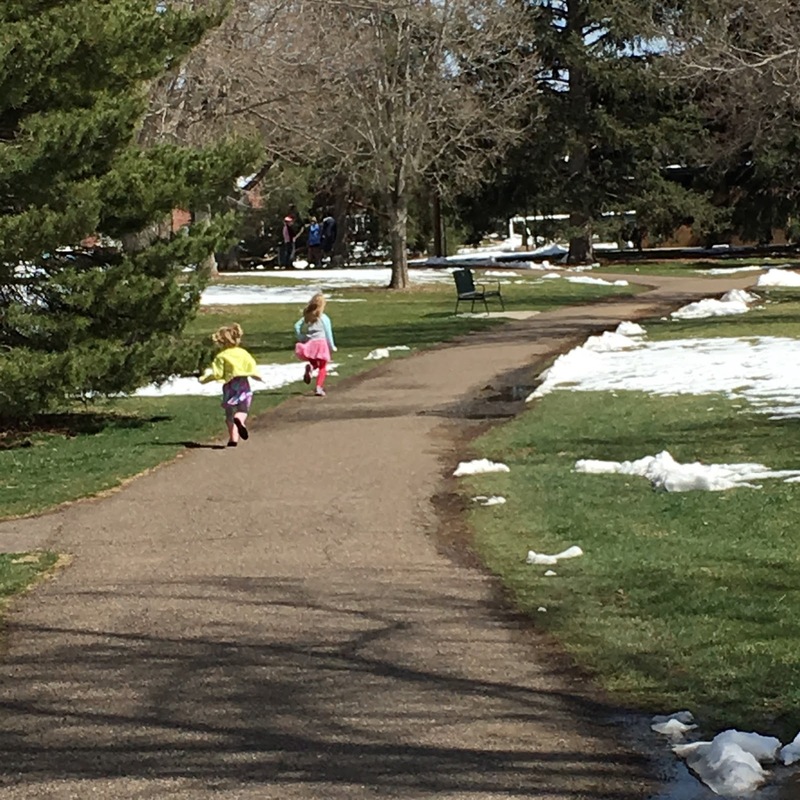 It's spring break for my granddaughters and they spent all day Monday with me. I'd love to tell you all the fun things we did, and it was a great day, but something happened near the end I'd like to focus on. Do you know this book? "In our bones we need the natural curves of hills, the scent of chaparral, the whisper of pines, the possibility of wildness." — Richard Louv, Last Child in the Woods Louv's website is here. In the afternoon, the girls and I decided to go to a nearby park. It is a large open space park with scattered trees, broad walkways, and a nice playground. They took off. I had been there before with Imogene, the four year old, but Ingrid, six, had not experienced it. They loved every bit, and had the whole place to themselves. Here are a few pictures from that time. It was a sunny and airy day, a happy time pretending different things and trying new equipment. But it was on our way to the car that a special thing happened. There were two large pines near the car, draping limbs all the way to the ground, but not so low that two little girls couldn't sneak under and IN! 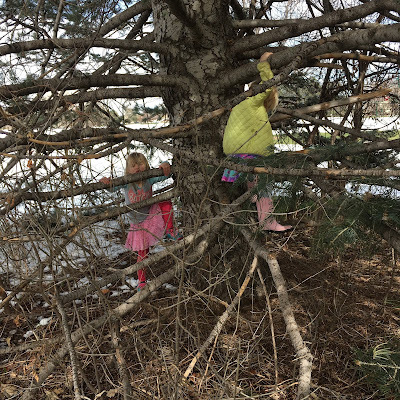 There are many trees in my neighborhood, and in different parks, but while we have looked (sometimes) we've never found a tree that would be a good climb for two small girls. "It's like we're really in the woods, Grandma." "Look, I can climb up fast. Can you see me?" "It's okay, I'm holding on tight. I just have to climb, Grandma. This tree is great." "Look how high I am!" "Oh, we have to come back." It was a magical maybe twenty minutes. We will return, with better shoes. And they will climb higher and love it. I hope you know about the need for more children to experience being outside in nature, to feel the magic of whatever they find that they love. Today showed me that power and I don't want any child to miss it. Ice cream is a good way to end such a day! What a wonderful day you spent with the girls, Linda. Here's to childhood fun! Yes. terrific. The tree branches were just right for young legs! Thanks, Carol. Sounds like a wonderful day together! I've been known to take squirrely afternoon classes for a walk outside before settling back in to work. Might not be Common Core or Standards Based, but sometimes we all need to feel the wind in our hair. Agreed, being outside is freeing for everyone. Thanks, Wendy. What joy! The pink tutu and boots get me. They look like little birds nesting in the tree. Such a perfect holiday week for them! Hilarious aren't they? I agree, but the clothes don't stop them! Thanks. A perfectly delightful day among the trees! One of my favorite books! As a parent I read it again and again. I haven't thought about it in some time --thank you for the reminder. I need to go find my dogeared copy! Sounds like a magical day! I noticed he has still a third book coming soon which I didn't know, Vitamin N (for nature). Glad you loved it, too, Clare. What a wonderful day! I just love those pink boots and tutu too. You are the BEST grandma, Linda! Thanks, Jennifer, it is certainly a lot of fun to be with my grandchildren. It looks like you all had a "grand"day nature. I've recommended Louv's book to many people. I figured that many who would be reading would know of Louv, but "just in case" I wanted to share his work again. It feels so important. Thanks, Adrienne. "I just have to climb, Grandma." That one sentence sums it up beautifully. So much joy in running free, exploring, climbing, and ice cream to top it off. What fun! 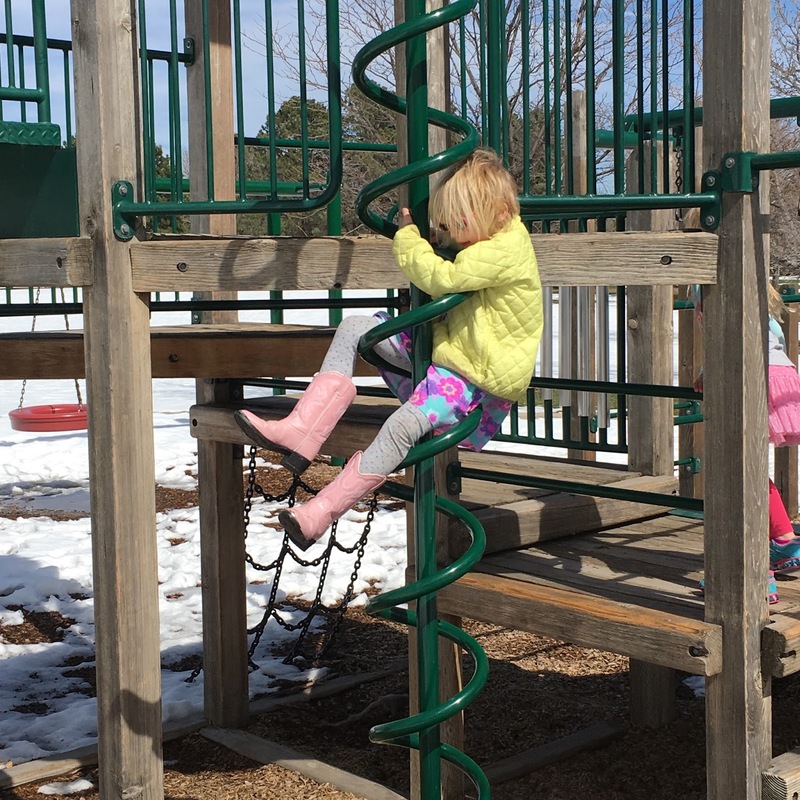 Ingrid has fun too, but Imi is such a climber. I loved that she said that, too, and with those boots, not easy. She did it, though! Thanks, Elsie. I love, love, love the Louv quote at the beginning of your slice. Definitely stands in sharp contrast to one of your next comments, that there was no one else at the park. Hmmmmm. I love seeing the girls climbing, even though that "be careful" thing kind of jumps in my throat! And then ice cream afterwards! What a fun grandma you are! You're right, no other kids were there anywhere, people walking, but no kids, even this spring break. The "be careful" is because of the slippery boots. Otherwise, I know what you mean, not what I usually do. Thanks, Carol. 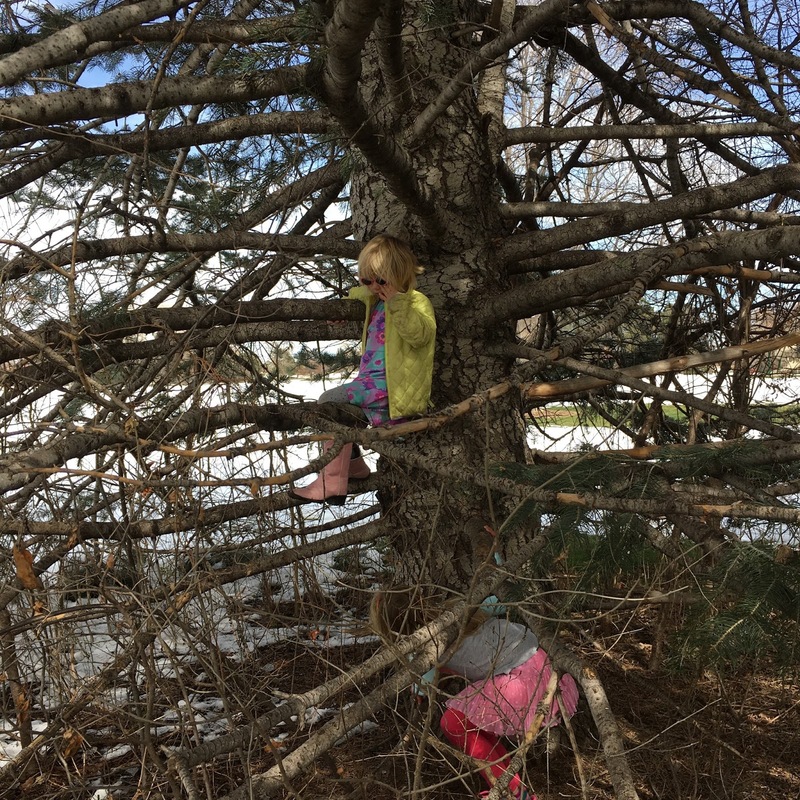 Tree climbing is a lost art and so valuable for young children to discover their "body confidence" as my sister-in-law used to say. Love the pictures! What a great outing! Thanks, the girls have wanted to climb "up" for a long time, & it was exciting to find this tree! Wow, that tree looks amazing! I bet even us "older" kids could climb that tree! And you are so right Linda, kids need to be kids and experience simple things like this! Great slice. The limbs were perfect for the girls, & maybe I could get in there, but they were very close together, Lynn. I remember climbing trees very fondly. Thanks! Yes-this is necessary for little ones! I loved this slice and pictures...what a wonderful reminder of the power of a good climbing tree. Thanks Lori, it was quite wonderful! An awesome adventure. 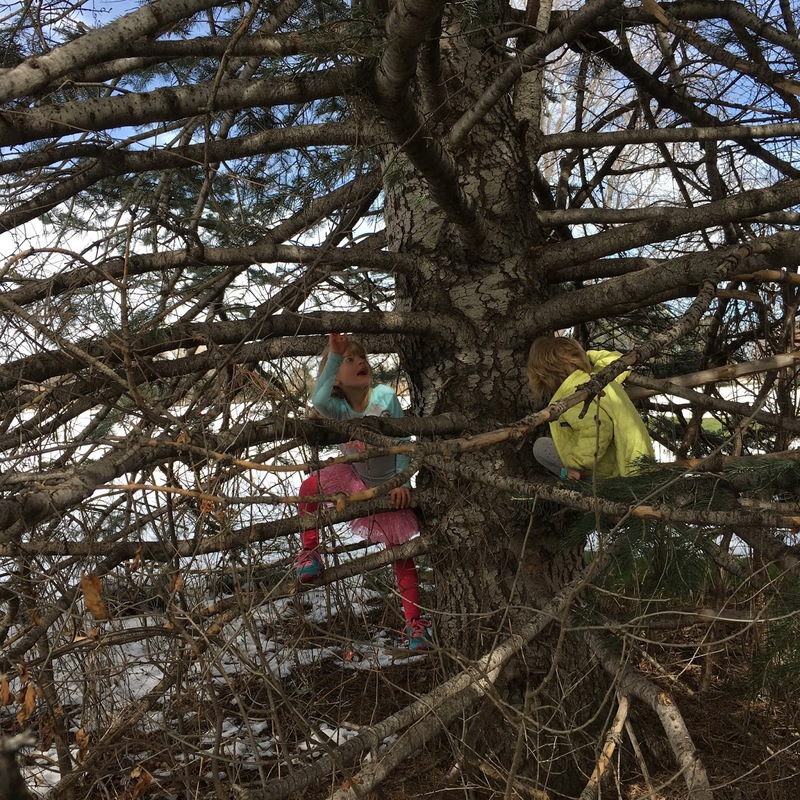 I am happy that the girls found a good tree to climb. Seems so much more fun than the human made monkey bars. They were so excited, Terje. 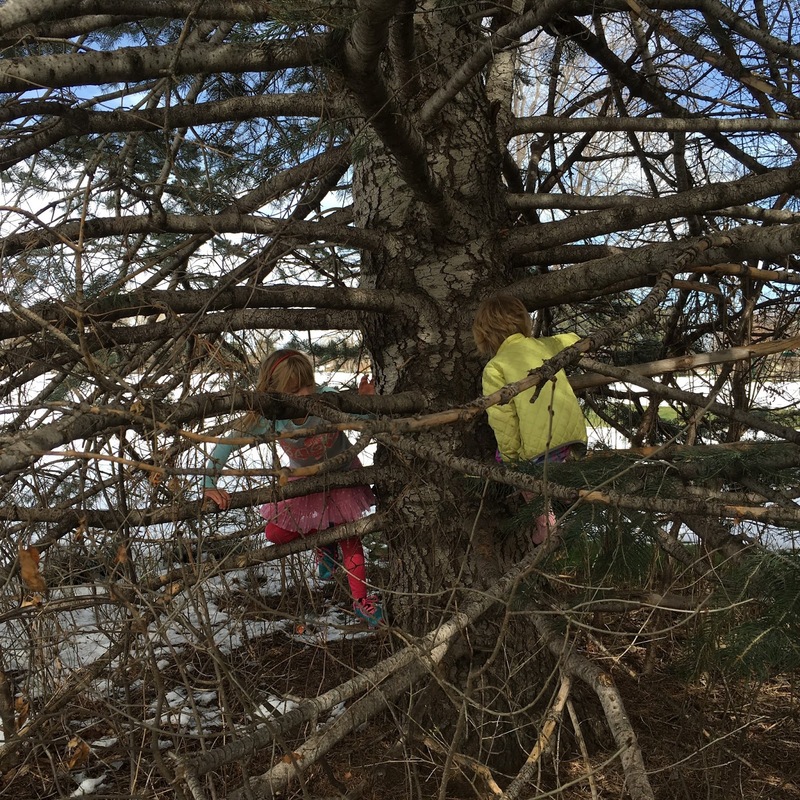 They like the monkey bars, but trees are just anew kind of problem-solving, right? Thanks! They do look like perfect climbing trees - and I have a feeling that there will be many return visits. Yes, I know we will, Tara. It was a happy discovery! I loved climbing trees as a kid! What a wonderful thing for them to do on a day out! 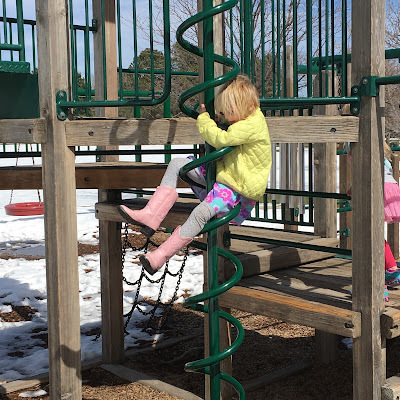 It is just want kids need - a chance to climb and see the world from a different point of view. Yes, I have fond memories of climbing too, Joanne. This is the beginning of some fun times! Somehow trees and kids just go together. There was nothing I enjoyed more than climbing trees. Love the excitement in you granddaughter's voices. Thanks, Bob. They were very excited. It was the end of a full day & Imi really needed better shoes, but we will return for sure. Climbing a tree in a tutu. Perfection! 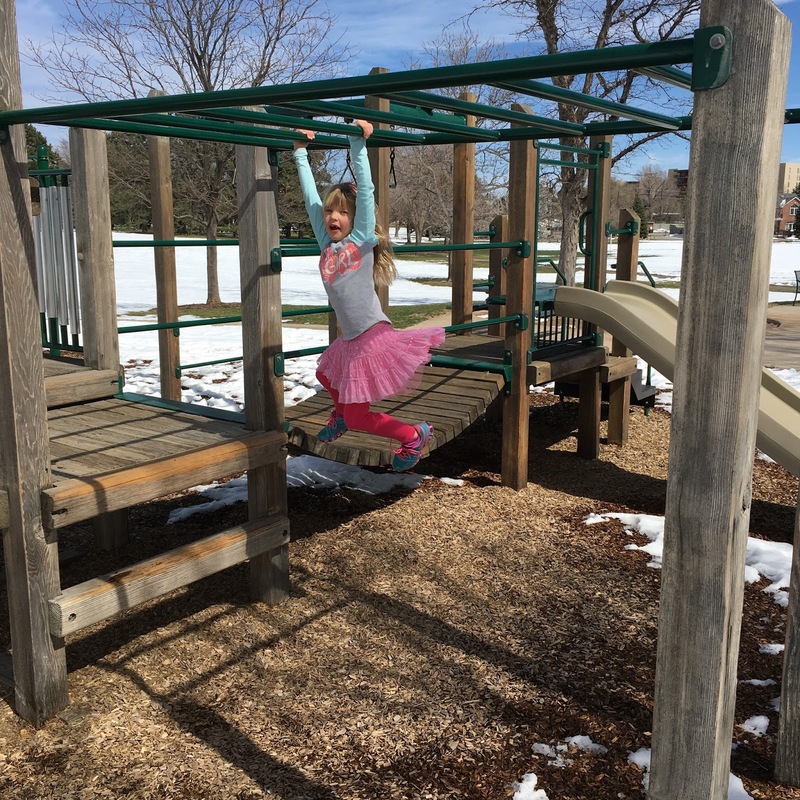 Tutus abound, don't they, and never keep a girl from doing anything she wants! Thanks, Bernadette. These are my favorite kinds of adventures! 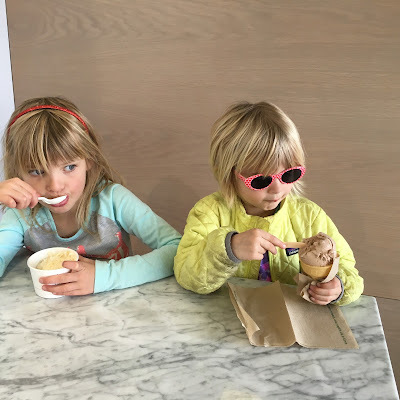 We should all climb trees and eat ice cream in our favorite shades. A beautiful slice. Thanks, Kendra. Imi did love her shades yesterday! Thanks, Jennifer. Having fun outside is what it should be! There is so, so much joy in these pictures. These girls are so fortunate to have you. I would have loved to have joined with Henry! It looks like a ton of fun! Henry would have loved being there. The last time we went out there was a younger one like Henry, and the girls let her join right in. Thanks, Ricki. I loved climbing trees when I was a kid. These joyous pictures of your granddaughters brought back many happy memories, Linda. Love the pink cowboy boots and tutu! Thanks for sharing your afternoon with us! I wonder if I shouldn't have asked everything to share their tree climbing adventures, Catherine? So many have such good memories of climbing. Thanks, it was a good day!